Can't slow the Engine to land!!! What's going to run out first - Fuel or Batteries? Shut Down That Gas Engine SAFELY – from your Tx! 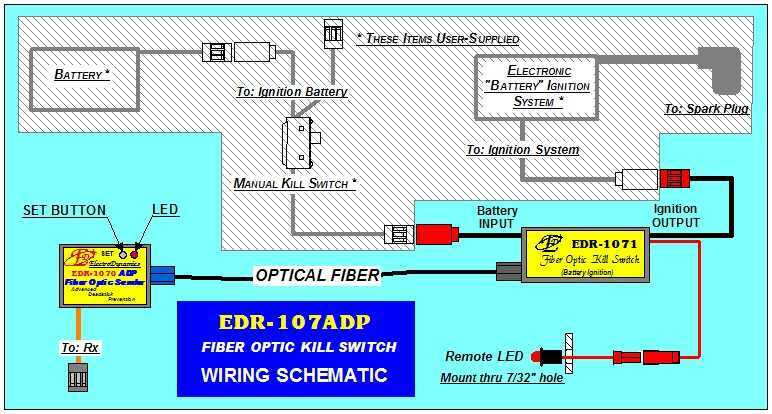 The EDR-107ADP Fiber Optic Kill Switch is THE Ultra-Reliable No-Interference Gas Ignition Kill Switch System. NOW IMPROVED with Advanced Deadstick Prevention! NOTHING beats physical distance between your engine's High-Voltage Ignition and your RC System.for squashing spark noise interference. Yes, EVEN on 2.4GHz systems! 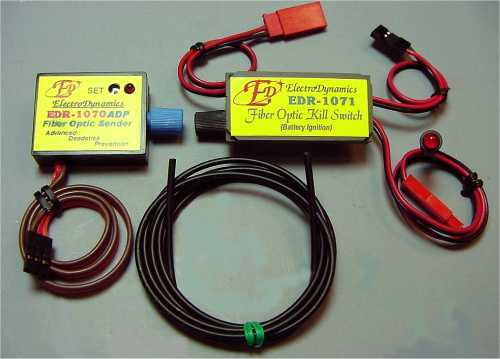 Our EDR-107 Systems have always used a plastic Optical Fiber to maintain a safe separation between Rx and Ignition. NOW, it's even better - ADP prevents an accidental deadstick if you should bump the Engine Kill switch on your Tx instead of the retract or dual-rate switch. For immediate Ignition Kill, "Double-click" the Tx Engine Kill switch. Save one precious channel - 'Kill-with-Throttle-Trim'! May also be programmed to function in the old Traditional Kill Switch mode, i.e., with ADP function disabled, for those who prefer it that way.